Justin Thomas will make his fourth visit to the Memorial Tournament. Officials of the Memorial Tournament presented by Nationwide announced today that the Tournament has accepted entries from 2010 Masters champion Adam Scott, World No. 10 Justin Thomas and rising star Jon Rahm to compete in the 42nd edition of the Memorial, May 29–June 4 at world-renowned Muirfield Village Golf Club. Scott has been a model of consistency throughout his professional career, recording at least one PGA TOUR victory in all but four years (2005, 2009, 2012 and 2015) since joining in 2003. Along the way, the 36-year-old Australian native has collected 13 TOUR wins, including the 2013 Masters Tournament, and career earnings totaling $46,045,007. Scott is coming off his third multiwin season, with back-to-back victories at the 2016 Honda Classic and World Golf Championships-Cadillac Championship. He has finished inside the top-10 two times in seven starts during his 2016–17 campaign and is ranked No. 11 in the world. Scott will be making his 10th start at the Memorial, looking to add to his career Tournament earnings of $934,361.33. He has recorded three top-10 finishes at Muirfield Village Golf Club and has a Tournament scoring average of 71.56. He matched his best Tournament finish in his last appearance at the Memorial in 2014 when he tied for fourth place, a feat he first accomplished in 2006. Thomas, 24, kicked off his 2016–17 PGA TOUR campaign in dominant fashion with three wins in his first six events. Now with 13 starts on the season he has an impressive six top-10 finishes, just one shy of his total through 28 events last season. The Kentucky native has already achieved a season-best in earnings with $4,449,220 in route to a No. 10 world ranking and No. 2 ranking in FedExCup points. In three seasons on the PGA TOUR Thomas has career earnings of $10,884,161 and is one of only eight players in TOUR history to card an 18-hole score of 59 during competition, which he achieved earlier this year in the opening round of the Sony Open in Hawaii at Waialae Country Club in Honolulu. Thomas will be making his fourth start at the Memorial. His best results came in 2014 when he finished tied for 37th place. His Tournament earnings total $25,420 and his scoring average at Muirfield Village Golf Club is 73. Thomas missed the CUT in 2016 after back-to-back rounds of 77. 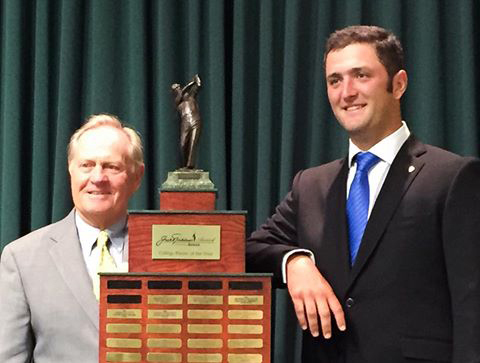 Jon Rahm received the Jack Nicklaus Award for Collegiate Player of the Year (Division I) in 2016. A decorated amateur, Rahm burst onto the PGA TOUR with three top-10 finishes in his first nine starts, including a T3 effort in his professional debut at the Quicken Loans National in June of 2016. The Spanish native captured his first-career TOUR title at the 2017 Farmers Insurance Open in just his 12th start, to go with five top-10 finishes in 11 starts this season. He is ranked No. 13 in the world and No. 4 in FedExCup points. This will be Rahm’s first Memorial Tournament appearance, however, not his first trip to Muirfield Village Golf Club. Rahm visited Dublin, Ohio, last year during the final round of the Memorial to receive the Jack Nicklaus Award as Collegiate Player of the Year in Division I. The Sun Devil also was the first two-time winner of the Ben Hogan Award as a junior and senior at Arizona State. The 2017 Memorial Tournament presented by Nationwide is scheduled for May 29–June 4 at Muirfield Village Golf Club. The public may call the Tournament Ticket Office 9 a.m.–5 p.m. weekdays at 877-MT BADGE (877-682-2343) or visit www.memorialbadges.com to purchase badges. Kids 18 and under can attend for free with a ticketed adult. Daily practice round tickets for Monday, Tuesday and Wednesday are also available. The cost is $35 and they are valid for all three practice-round days.